In order to meet excellent quality standards, we are supplying HSS Spiral Fluted Tap. These standard style taps have straight flutes of a number specified as either standard or optional. Hand taps are for general purpose applications such as production tapping or hand tapping operations. Taper, plug and bottoming styles provide versatility in tough materials, blind and through holes. 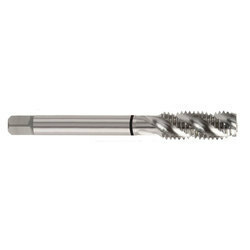 Spiral Flute Taps have both blind hole application and through hole application . They are also better to tap a thread in a hole where there is a break in the material, e.g. another hole, as the spiral fluting helps the tap to pick up on the other side. Spiral flute taps can have slow or fast helix angles. 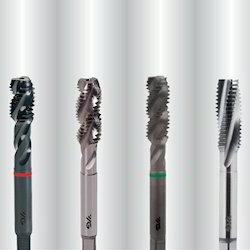 With our expertise and trustworthiness, we are engaged in offering an optimum quality range of HSS Spiral Flute Taps. Banking on our enriched industry experience, we are able to supply HSS Spiral Fluted Tap. We are a top-notch organization, engaged in providing HSS Spiral Fluted Tap. We are one of the leading organizations actively involved in offering HSS Spiral Fluted Tap. Enriched with a vast industry experience, we are offering HSS Spiral Fluted Tap. We feel pleased to offer a comprehensive range of H.S.S Hand & Machine Spiral Flute Tapes. These products are supplied in M35 & M42 with several surface treatment such as Steam tempered, Blued, Nitrides and Titanium Nitride. Our reputed entity is engaged in supplying HSS Spiral Fluted Tap. We are a remarkable entity, engaged in offering supreme quality of HSS Spiral Fluted Tap. We are engaged in offering HSS Spiral Fluted Tap. Owing to the presence of our expert team members, we are able to offer HSS Spiral Fluted Tap. Relying on our expertise in this domain, we are engaged in offering HSS Spiral Fluted Tap. With thorough understanding of the relevant industry, we are offering a wide range of HSS Spiral Fluted Tap.